Yes, it has been quite some time since my last post, more than several months have past however I am back! I will not bore you with all the details but suffice it to say sometimes one's Life may go up in flames so that she rises out of the ashes restored and even more brilliant just as the Phoenix rises to soar again to even greater heights. How à propos that today is the day I return to posting as many of you may be aware that it is one of my favorite days of the month next to the New Moon, today is the month of May's full moon. 2nd full moon of May 2007 known as a blue moon. 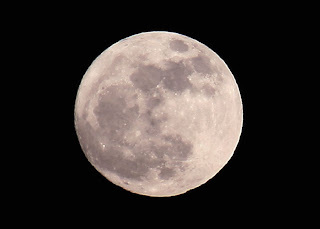 May's full moon is also known as the flower moon, corn planting moon or milk moon. I personally like the name Flower Moon because its the time of year that all the lovely flowers are really coming into their own. May favorite flower, or at least one of many, is the Asiatic Lily. The above lily photo borrowed from this website. 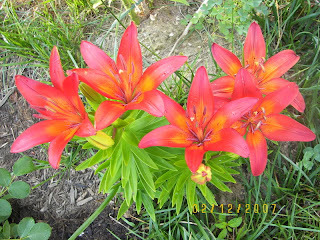 Mine have yet to bloom but I assure you that once they do I will definitely post photos. Anyway, I am glad to be back. I am glad to have risen from the ashes. So many new ventures happening in my life. So much growth, love and positivity. Of course there were a lot of tears but I truly believe that one can only really enjoy the joy in their life only when they have experienced sorrow. One appreciates the sunrise only when they have also been through darkness. Part of my time off was to concentrate on school. Yes, I have finally pursued a long time dream of mine which was to attend Massage Therapy School. And I did it!! Yeah for me! And the last piece of good news I will share is that I am expecting my forth child. I can hardly believe my eyes when I read what I have read. Yes, my forth child. This little blessing will arrive in just a couple of months. *sigh...onward, outward, inward and upward. So much love to share and so much love to receive. May you all be so blessed to understand just how much you have to be thankful for.